I think it's funny that some people have such negative views on this topic. You hear comments like "Dogs have been out in the wild for hundreds of years without outerwear.... it's ridiculous that people buy coats for their pets...." yadayadayada. Me? I'm a practical person. I live in suburbia and own dogs who spend most of their time indoors. So when the temps drop below about 35 degrees, they are freakin' cold! How do I know this? I'm the person on the other end of the leash and I see them shivering, especially my boy Tinker who has very little body fat. So what do I do? When it's cold, I put well-made sweaters or coats on them that fit properly, don't drag in the snow, and really add warmth (not the type that are poorly made from cheap fleece and fall apart in a season- been there/done that) . I'm not a froufrou person and it's not about making a fashion statement with my pets... and I don't give a hang if people roll their eyes. The dogs are obviously uncomfortably cold so I help them by adding warmth. It seems like an obvious solution to me. I'm also concerned that they stay comfortable with changing seasons as they get older. Like people, their tolerance to heat and cold may diminish as they age. Though it could be an issue with some dogs, I have never had a problem with ours attempting to take their coats off, so that's a big plus. We've gone through a few models over the years and struggled with various clips and velcro closures. 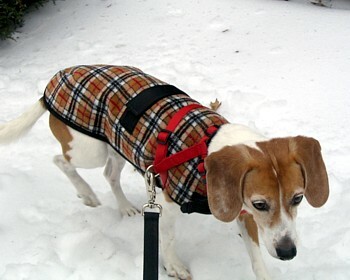 Last winter we bought a coat for Virginia that is really attractive and well-made. The nicest ones I've found are made by companies that make horse blankets and tailor them for dogs. 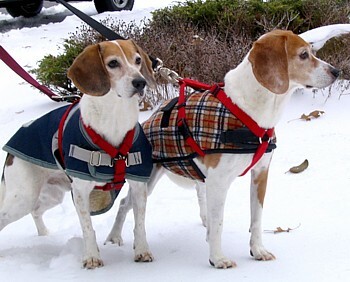 For those of you who use harnesses to leash walk your dog, note in these pictures that you see harnesses worn over the coats. There are, however, some manufacturers who cut a small hole in their coats mid-way down the back to allow the jump ring from the harness underneath to poke through and be clipped to the leash. 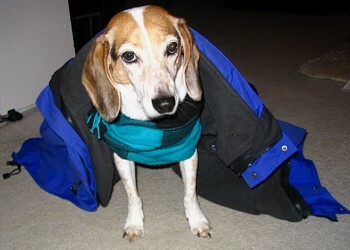 Otherwise, during coat-wearing season, the harness needs to be adjusted to fit over the coat. So..... do what works best for you and your dog(s) to stay warm!! While we're on the topic, here are some additional tips for keeping your pets safe during the winter months.